Generally speaking, the function of the solar road studs warn the drivers to know the road condition in advance and guide them in rainy or foggy days or in the days with lower visibility by synchronized flashing. 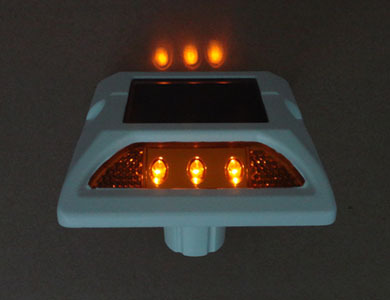 Compared with the reflective road stud, the solar road stud can give out light initiatively and give warnings by flashing. Also, compared with the ordinary solar road stud, the synchronized flashing solar road stud has the advantages of dazzling prevention and gives warnings clearly and orderly. 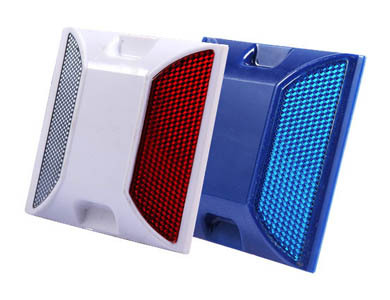 High brightness: The reflective brightness of the ordinary reflective road stud is only 300-400MCD, but the brightness of the solar road stud can be over 2000MCD, which is 6 to 7 times of the former one, and the high brightness can penetrate rain or fog at night and guide the way effectively for the drivers. Flashing synchronically and giving warnings initiatively: The solar road stud can flash in a certain frequency at night, and the visual of people are more sensitive to changes, so the warning function of the solar road stud is quite strong. Giving out light initiatively can not only avoid interruptions of rain and fog to the greatest extent, but make the drivers get rid of the reliance of light of cars, which will make the visual distance longer and greater. The solar road stud plays key role in rainy or foggy days and it does more in the aspect of eliminating security risks. NOKIN is a professional factory that can provide high-quality solar road studs, and the products of NOKIN have been installed in hundreds of roads. The products of NOKIN all pass the tests of the Ministry of Transport. It combines research and development, design, producing and installation together, and it is always working on provide high-quality products to clients all over the world. If you want to use good solar road stud, NOKIN will be your best choice.